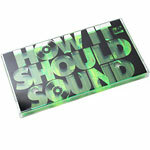 Long awaited cassette release of How It Should Sound Volumes 3, 4 & 5 as a unique triple pack featuring 3 neon green tapes in a clear oversized case with a transparent insert. Each tape has the volume number screened on one side. Highly anticipated follow up to How It Should Sound Vol 1 & 2, another installment of archived material from one of the finest purveyors of dusty, neck-snapping instrumentals to ever lay his fingers on those trusty sixteen pads: Damu The Fudgemunk. Pulled together from the same stack of basement-dwelling floppies that went into the creation of HISS Vol 1 & 2. The (previously unheard / unreleased) beats featured in this collection were all created between 2003 and 2007 and although time moves on there are undoubtedly some things that are timeless. This is instrumental hip hop that stays true to its roots whilst building on tradition, the crack and pop of old vinyl nestled contentedly in layered compositions that knock, swing, and groove. Relax and enjoy: perhaps unsurprisingly, it sounds just like it should.